It is no secret that the manufacturing sector in the United States has been declining for several years; however, momentum is turning around. According to the National Association of Manufacturers’ website, manufacturers contributed $1.87 trillion to the economy in 2012, up from $1.73 trillion in 2011. This was 11.9 percent of GDP. For every $1.00 spent in manufacturing, another $1.48 is added to the economy, the highest multiplier effect of any economic sector. It is obvious that for the U.S. to remain a powerhouse in the global economy, the manufacturing sector must continue to grow. If you are a business owner, you know that increasing your workforce creates many challenges, particularly when special skill sets are needed, such as welding. When advanced job skills are required, such as welding exotic metals in different positions, an employer has two options. First, the company can attempt to hire someone who already possesses the needed knowledge, skills, and abilities, but that individual is typically in high demand and may require a high salary just to get them through the door. Plus, retention of these workers is difficult since they will likely have multiple opportunities available to them. Second, an employer can develop a highly skilled workforce from within by hiring a person with few or basic skills, but with the right kind of character and potential. Then the difficulty is how to train the newly hired workers in the skillsets the company needs. One alternative is to place the new hire in the plant, along-side a more experienced worker for on-the-job training (OJT). But this could take many months and reduces the productivity of the experienced personnel. A second alternative is to hire graduates of a trade school or community college who have the basic skill knowledge. However, this still requires a lengthy OJT process for the new hire to learn the specialized skills and techniques needed by the company. Now there is a third option: on-site, fast-track training for entry-level employees that is customized to the skillsets the company needs. This innovative option to developing your workforce is to contract with a training partner that will take your new and existing workforce and develop the exact skill set needed to satisfy your specific requirements. This revolutionary new attitude toward training can take new hires with no skills and turn them into a productive labor force within weeks, not months. The key aspect of this type of training involves providing an intensive, hands-on class right at the start. Once the new hires have been certified to the required level, then the on-the-job training can begin, with much less time, supervision, and hand-holding than is normally required. The training partner brings the training and all equipment needed to your facility to maximize skills development. A real bonus to this type of training is that it instills commitment and loyalty on the part of the trainees and the hiring company. The trainees are more productive and retention rates are vastly improved. One example of this on-site training partnership is the Advanced Manufacturing Skills Training provided by Texas A&M Engineering Extension Service (TEEX) Knowledge Engineering. 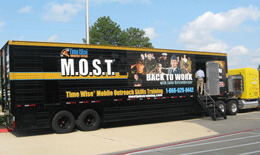 The M.O.S.T.® (Mobile Outreach Skills Training) Certified Welder program is a 2- or 3-week course customized to a company’s products. Certifications are offered for carbon steel and exotic materials in 1G through 6G positions. All training is delivered on-site at the manufacturing facility, utilizing a state-of-the-art welding simulator and expert instructors on the M.O.S.T. mobile unit. Since this intensive skills training program began in Florida in 2008, the completion rate has been 94% with a 90-day retention rate of 91%.